A benchtop planer is one of the most essential pieces of power tools found in the workshop. It would be virtually impossible to deal with wood and not have one of these machines. With the best benchtop planer, it’s easy to turn that old, worn out, rugged, rough piece of lumber into a smooth material. It doesn’t just reduce the thickness of the wood, but also makes the sides parallel and smooths out uneven surfaces. That’s why you must read through the best benchtop planer reviews to find the model right for your shop. Many thickness planers are too expensive for the average hobbyist and only found as a massive piece of machinery. With a benchtop planer, you have access to a lower cost option that’s also portable. They work just like the larger counterparts, but for less money. The industrial-grade planers handle lumber up to 20 inches, while a benchtop planer accommodates sizes up to 13 inches. The reality is that the heavy-duty thickness of an industrial planer is usually overkill for the average user. With the smaller, portable option, you’ll also be able to fit it in the workshop better. Contractors have just as much luck using these smaller units because they are movable to any job site. With all the options on the market, it’s tough to figure out what the best benchtop planer is; that’s why we put together this guide. We’ve evaluated all the brands and features to pick out the very best for you. You want to make sure that you buy the one that suits your needs; otherwise, you just have an expensive paperweight. Let’s dive right into our best choices. How Does a Benchtop Planer Work? All of these models handle boards up to 13-inches wide. There’s a nice selection of features among these machines and price points as well. If you need the best benchtop planer, you’re sure to find a model that suits your needs among these units. DeWalt is a trusted brand among remodelers and contractors because they provide durable, long-lasting power tools. That’s why it makes sense that they arrived on our best benchtop planer list. The price of this machine reflects the vast amount of features it comes with and the fact that it’s geared toward professional use. Inside the package, you’ll find infeed and outfeed tables that provide 33-1/2” of material support, a dust hose adapter, plus an extra knife set. With this unit, you have adjustable speed which gives you superior control over your work. With the changeable feed speeds, it’s simple to optimize your cuts. Depth capacity is six inches while it handles widths of 13 inches. You can also use the extra-large depth turret which allows you to cut at a thickness used most often. The three-knife cutter extends the life by an additional 30%. If you need to change the knives, that’s also simple to do. With a powerful 15-amp motor and 20,000 cuts per minute you won’t have any trouble getting your jobs done. In addition, there’s an automatic carriage lock that reduces movement. This unit does weigh 92 pounds, so you aren’t going to be able to move it easily, but the unit’s quite durable. The additional 19-3/4” aluminum base increases the tool’s durability as well. What we really love about DeWalt is their extended warranty. This benchtop planer comes with a three-year warranty and a free one-year service contract as well. You might need to purchase some additional knives if you plan to work with hardwoods as these might not be sufficient for that level of work. Overall, there’s nothing negative that can be said about this other than it’s one of the most expensive on our list, but well worth the cost. This 13-inch planer is a mid-range option, geared toward both the professional contractor and DIYer alike. The 15-amp motor produces 18,800 cuts per minute. This allows it to handle all the demands of your projects. On top of that, there is a stainless steel bed to reduce friction. You’ll also be thankful for the overload button which prevents overheating. The maximum cut length is 3/32-inches. With the two double-edged reversible knives, you have the cuts you desire. Plus, they’re part of a quick change system so there’s no struggling with alignment jigs. The two polyurethane rollers stop your material from slippage. They are positioned along the cutter head to give you a smooth result. The accurate cutter head is machine-steeled for accuracy and endurance. This four-column design provides a stable machine for long-term use. Plus, it only weighs 58 pounds and comes with a warranty spanning five years, which is the longest of any we reviewed. 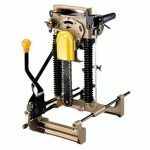 You can use this planer for your small projects or for your extensive, heavy-duty work as well. Plus, the price is better than the previous model. The only thing it’s not good for is hardwoods, so if that’s something you do on a regular basis, this might not work for you. If you want a mid-range priced tool that offers great value and accuracy, then the Wen is a great option for you. This made our list of the best benchtop planer because it has a 15-amp motor that produces 25,500 cuts per minute. On top of that, the fan-assisted dust port removes all sawdust and chips from your workplace. The double-edged carbon steel blades are durable and just what you need to get the job done. In addition, the granite table isn’t going to warp, so you have a smooth surface to complete your work. The manufacturer offers a 2-year warranty to give you some extra peace of mind. This planer’s cast iron construction allows you to count on the reliability and sturdiness. Plane wood that’s 13-inches wide and 6-inches thick. At just 66 pounds, this isn’t overly heavy that you wouldn’t be able to move it around, but it also adds stability for higher-quality work. We don’t recommend it in an industrial woodshop, but for the average user, this is going to do exactly what you need. Some people have reported sniping on the edges, but it doesn’t seem to be a huge concern for most users. While this isn’t the most well-known name on the list, customers swear it’s the best benchtop planer. The price is quite high, so you know it’s geared toward a professional user. This planer has every feature that a professional woodworker dreams about. The 15-amp motor averages about 30,000 cuts per minute. It also comes with four heavy-duty guideposts and another two screw posts. These give it optimal stability during operation. Aside from that, it does weigh 88 pounds; so you aren’t easily rocking the planer during your cuts. Many people are happy that it contains a cutterhead snipe lock and internal gears which adjust the height. The infield and outfield tables are large enough for the longest boards. There’s also a spiral cutterhead that has a total of 26 two-sided tips. If that’s not enough, there’s a dust chute for superior chip removal while working. When you need to rotate or change your cutterhead tips, you’ll find this machine makes it simple enough for a beginner to figure out. They’ve also provided a two-year warranty so you don’t need to worry about any defects. Really, the only downside to this planer is the price. If you aren’t planning to use it often or in a heavy-duty manner, it probably won’t be worth it to you. If you’re looking for the best benchtop planer with a 12-1/2” capability, we’ve picked out a few of those for you as well. These are all reputable brands that will help you accomplish your tasks with ease. This DeWalt is an older version of the DW735X and the biggest difference is the smaller blade. Another thing you might notice is that the newer model contains the auto carriage locking mechanism that this doesn’t come with. With that said, this model comes in more than ten pounds lighter than that one and contains a lower price tag. The package includes a dust hood to keep your area clean from debris. They’ve also included their popular three-year warranty and one-year service contract in case anything should go wrong. With the reversible and disposable three-blade system, you’ll gain 30% more knife life than with other machines. They’re also easy to change. If you need a fine finish, you’ll be happy to know that the cutterhead accomplishes 96 cuts per inch. The powerful 15-amp motor performs 20,000 cuts per minute. With the turret depth stop, users can easily utilize the most used depth. In addition, the four-column carriage lock removes snipe. The outfeed and infeed tables offer support to 33-1/2” of material plus there’s an additional gauge and scale to make the most accurate cuts possible. Many professionals turn to this product when they need to save a little money but still want top-notch results with their work. You might find that if you use it often that it goes through blades fast, but for the benefits you receive, it’s well worth it. When you look at the price of this planer, you might think it’s not as good as some of the others, but that’s not true. This made the best benchtop planer list because of how well it performs. In addition, this planer is made from high-quality metal so you know it’s durable, sturdy and tough. You won’t have trouble running any type of wood through this planer. It’s free of vibration, but sometimes a little loud. This thickness planer produces a smooth surface which requires minimal sanding. The great part about this unit is that it’s lightweight and portable. It’s heavy enough to provide stability while planning, but then light enough that you can carry it around. It also features a two horsepower motor and makes 19,000 cuts per minute. The cutterhead uses two knives instead of three like we’ve seen on many other models. If you can get past that, you won’t even notice the difference. There’s also an on/off toggle switch plus a safety lock. With the thermal overload protection, your machine won’t overheat. Height adjustments with the planer are accurate and easy to accomplish. Instead of a dust collection system, this comes with a deflector shield instead. They also provide a one-year warranty to keep you protected. Dropping even further in price and weight, we have this model from Powertec. It’s a great option for anyone that needs to plane but doesn’t want to spend a lot to do it. For the price, there’s no reason anyone should be without one in their woodshop. The four-column design increases stability and adds precision for exceptional accuracy. The return rollers help to plane long boards while the side-mounted carrying handles allow you to move the unit to another location when needed. With the index pin setup, the blades are easy to replace as well. You’ll find that the spindle locks keep the blades from moving around during a changing. It comes powered by a 2 HP, 15-amp motor that makes 18,800 cuts per minute. This means you’ll achieve a smooth finish no matter what material you’re working with. This option as the best benchtop planer does have a one-year warranty for some additional peace of mind. If you want the best benchtop planer, you might want to consider the WEN brand. We talked about the 13-inch above, but this one is designed for 12-1/2” instead. The price is reasonable and the 15-amp motor is powerful enough to produce 18,000 cuts per minute. With this machine, you’ll have no trouble repurposing the old, jagged and rough pieces of wood you have into something fantastic. This system utilizes a two-blade cutting mechanism and features a smooth granite table. With this design, you don’t have to worry about warping. It also comes with a heavy-duty cast iron base that offers some additional stability. This gives you a wobble-free, steady place to transform your wood. There’s a two-year warranty available to offer some additional protection. The table does weigh 79 pounds, so it isn’t too heavy to move around. In addition, it comes complete with side handles and a collapsible design for easier transport. If you need something that only has a 12-inch capability but is still considered the best benchtop planer, we have two more options available to you. One is on the pricier side but the other would be considered budget-friendly. It would be nearly impossible to create a list for the best benchtop planer and not include this Makita model. Yes, it is a little on the expensive side, but a quick look at what’s offered justifies that cost, especially for professional woodworkers. The package comes with a 12-inch double-edged planer blade, a magnetic holder, key, blade wrench, plus a toolbox. This machine is quieter than many others on the list which makes operation much more comfortable. On top of that, the interna-lock option eliminates sniping completely. Isn’t that worth a little extra money? The motor is quite powerful as well with 15-amps and 17,000 cuts per minute. In addition, it weighs just 62 pounds, so you won’t have any issue transporting it to the job site and back to your home workshop again. Something that sets this unit apart is the LED light to alert you when the plug is in. Many people find that the blades are simple to change, but not so much for beginners. On top of that, there are disposable double-edge blades available. It even comes complete with a dust collector for a tidy workspace. Makita is a leader in the industry, so you can trust the planer to be made of high-quality materials. If something should go wrong, you’re covered by a three-year warranty, plus you have a 30-day money-back guarantee if you don’t like it. The final addition to our best benchtop planer list is this model from Porter-Cable. It’s a 15-amp basic planer that’s low cost and easy on the budget. Don’t let the low price keep you away though; it’s a stellar option for anyone needing to transform some lumbar into fine pieces of wood. At just 65 pounds, it’s easy to transport this anywhere or move it around your shop. You’ll find that cutting through hard boards is a breeze and it’s exceptionally quiet as well. The blades feature notches or indexing holes so you don’t need jigs for blade replacement. All the blades are double-sided, so if one becomes blunt, just flip it over to the other side and it’s like having a new blade. If you want to lower or raise the blade, the cranking mechanism is easy to use. The only major complaint is that there’s some sniping on both ends for many people. If you can support it on both ends, you won’t experience this problem. In addition, this machine features a Poly-V belt cutter head drive plus rugged gearbox for maximum amounts of power transform. While we don’t recommend this for professional use, any home user will be thrilled with the performance. Planers are often used with a jointer to achieve a perfectly square, parallel and flat board from an unmilled, raw piece of lumber. What many people don’t know is you can achieve this simply with a planer. This means you’ll save money only purchasing one tool instead of two. Let’s look at the differences between the two. The joiner gives your unmilled piece of lumbar a perfectly square edge and flat face. When you have a jointer and planer, you use the jointer first to flatten a side. Then, the planer makes the other side square and flat plus parallel to the other side. While you could utilize your jointer on both sides, you have no guarantee that both sides will end up parallel. Instead, you’ll probably get a board with more thickness on one end than the other. It usually looks like a wedge. Planers are a versatile tool for any woodworking enthusiast because they make it easy to take the thickness to any size you need. You could take a rough piece of lumber that’s naturally six-inches thick and bring it to a three-inch square if you desire. With a planer, you really don’t have a need for a jointer. The benchtop planer uses a motor that’s connected to both the cutterhead plus the roller assembly. These rollers feed the lumbar or board into the cutterhead. Then, the planer’s motor spins its cutter head quickly. This chops off a portion of the thickness, allowing the machine to reduce the thickness to your desired size. While doing this, the power tool also creates a fine finish. All of these parts must be considered when making your purchase selection because they all play a role in the quality of work that’s achieved. Here’s a more detailed list of what to look for in regards to these parts. Power should be your number one factor when looking for the best benchtop planer. If you want a quality job done, then power is your most important aspect. The only time you wouldn’t need high power is if you’re working with soft woods like pine, but there might be times when you need to process oak or other hardwoods with ease. If you attempt to plane wood with a motor that isn’t up to the task, you’ll burn it out and all you’ll have is a worthless machine. The RPM speed is the best way to determine the power of a planer. The lowest speed you want is 8000 RPM; anything lower than that simply won’t cut it. You want to look at the cutterhead before making your purchase as well. The quality of this part reflects the type of finish you’ll expect. It also indicates how much noise you’ll receive. You have the choice between straight knives or helical cutterheads. Each one has their own disadvantages and advantages. With a helical cutterhead, you’ll produce higher-quality finishes with minimal noise. The downside is that they require more power and cost more. In addition, the helical cutterhead is constructed of carbide. This makes them more difficult to sharpen but they do retain their sharpness for longer periods. The straight knives option is lower cost and easy to feed. They’re also quite easy to sharpen because they’re made from high-speed steel. With that said, they often don’t come on machines with top-notch power because they’re a cheaper design. Even if you want a different cutterhead with the machine you choose, you can purchase another cutterhead for replacement. Just keep in mind that this often voids your warranty. You want to have the best power tools in your workshop. If you decide on something lower-quality, you’ll avoid using it and the machine goes to waste. Even if you do use it, the construction of it won’t be durable and it most likely won’t last. That’s why you need to evaluate all these criteria before making your decision. You want to know what the capacity of your machine is. This reflects how much lumber or the size of board you can plane. You want a planer that handles more than eleven-inches wide and six inches thick. Planing lumber isn’t a game. There’s lots of movement occurring and plenty of powerful parts operating. Without a solid construction, you risk lots of vibration and shaking. That’s why it’s imperative to choose the best benchtop planer that features a rigid and sturdy construction. The best choice is something with a cast iron base. These keep your planer stable so it doesn’t wobble during your work. No matter what benchtop planer seems like the best to you, the depth adjustment needs to be easy to use. You want linear scales and accurate gauges. There should also be some understandable directions on how to adjust and utilize them. If you aren’t familiar with snipe, it’s the defect that happens when you feed the board in and out of your planer. What occurs is the weight of your board pulls downward on the free end. This pushes the other end into your cutterhead. What you’re left with is a dip at your ends. There’s no way to completely eliminate it without properly supporting your wood. With that said, there are ways to reduce it with the best benchtop planer. If you purchase something low-quality, you’ll be dealing with more snipe than you might want. Any woodworking machine creates dust, so you want something that has a system to handle the mess. Without a proper collection system, you’re left with a big mess. The best benchtop planer comes with a superior dust port that controls the debris in an orderly manner. With the right system, it’s easy to collect all the dust you produce and maintain a tidy workshop. While we don’t like to admit that price is a factor, it’s often one of the top considerations. Despite how often we tell you that the best tools tend to cost more, there are still plenty of people that must stick to a budget. We get it! 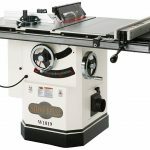 Thankfully, you can find decent benchtop planers in a variety of price points. While you might not be able to afford the one with every bell and whistle, you still want to do your research and get the best you can. Just keep in mind, once again, that spending a little more might save you money in the future. If your machine breaks and you need to buy another one in a year, how much money will you have spent then? Before you decide what the best benchtop planer is for you, there are some questions to ask yourself. Will you need to do more extensive projects in the future? You want to make a purchase that fits your needs now and in the future. Don’t pick a planer simply by looks but pay close attention to the features and construction. Sometimes a little more money takes you from a basic machine up to something with some handy features. No planer ’s perfect, but you should find something that fits your needs without sacrificing your budget.